In just a week, St. Patrick's Day will be upon us. And with it comes the whimsy of leprechauns and pots of gold, shamrocks and rainbows. Marked every year on March 17 since 1737, the day is intended to honour Ireland's patron saint. The first celebration was organized by the Charitable Irish Society of Boston. The tradition continued in other communities until today when many cities world-wide host a St. Patrick's celebration of some kind, highlighted by parades, festive drinks and music. In Ireland, the occasion has more of a religious theme. However, you don't have to be Irish to go green. From wearing the colour that day to drinking it out of a beer mug, from attending church to watching a parade, many people of all denominations and cultures will recognize the occasion. Growing up in a small town surrounded by a predominantly German farm community, St. Patrick's Day wasn't discussed much at home. For me it was typically the projects we undertook in class during my primary education, and the promise of a day that would be a little different from the regular routine that made it exciting. 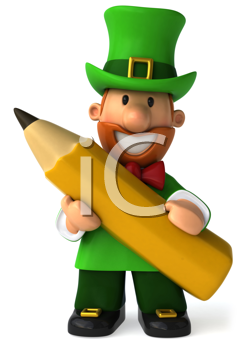 Craft classes were occupied with cutting, colouring and pasting cute images of leprechauns and shamrocks. The playground was full of excited chatter about what green item of clothing friends would be wearing to school March 17. Interestingly now, as an adult, things haven't really drifted too far from that for me. I still search the closet for something green, which has often been a challenge as I apparently don't infuse my wardrobe with much of that colour.